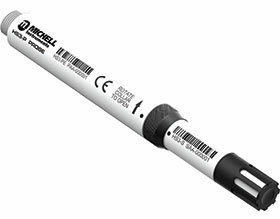 The Michell HygroSmart HS3 advanced interchangeable relative humidity and temperature probe is 100% configurable to give users maximum flexibility. It also allows for alterations to RH measurements, to keep step with changes or developments in the process. Users can set the zero/span range, output signals and choose from five output parameters including dew point. All these changes and settings are made on a PC via the application software. The unit can also be ordered directly from Michell with the probes fully configured to unique, individual specifications. The instrument ensures zero process downtime by keeping maintenance to a minimum with an interchangeable sensor. When recalibration is due, the old HygroSmart HS3 sensor is simply exchanged for a new, freshly calibrated one. This simple procedure allows for the probe to remain installed, and takes only a few seconds to carry out. Using the replaceable sensor ensures that the HygroSmart HS3 probe has a low lifetime cost, when compared to fully disposable probes. Alternatively, minor calibration adjustments can be easily made on any installed HS3 probe, with a 5-point digital trim adjustment via the application software to ensure maximum accuracy without needing to replace the sensor. Designed for demanding industrial conditions, the HygroSmart HS3 probe features a solid corrosion-resistant body, 10 bar pressure sealing and IP67 pressure rating. In addition it also has an accuracy of 0,8% RH, making it among the most accurate probes on the market.